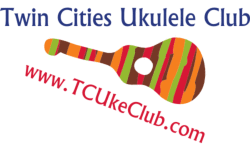 Virtually all of the Twin Cities Ukulele Club and StrumMn jams and events are sponsored by Minneapolis Parks & Recreation, Cadenza, Groth & Riff City music stores, and by the Minnesota Bluegrass and Old-Time Music Association (MBOTMA). ​What does this mean to you and me as ukulele players? We pay no facility charges for Minneapolis Park & Recreation Centers because our events are part of their programming. Please say “thank you” to the Rec Center management & staff. They are a pleasure to work with! We jam for free at Cadenza Music (St. Paul), Groth Music (Bloomington) and Riff City Music (New Hope) because of their generosity. Please make your ukulele & accessory purchases at Cadenza, Groth & Riff City and other local stores! We hold our large ukulele events at MBOTMA festivals. Without MBOTMA, we would most likely NOT have the Great Minnesota Uke Gathering & the Winter Oo-koo-lay-lay Weekend, events that feature local and national ukulele instructors, performers & jam leaders. Please join MBOTMA at https://www.minnesotabluegrass.org/Membership!